The Architectural Review Board meets on the fourth Wednesday of each month at City Hall, 5200 Emerald Parkway at 6:30 p.m., unless otherwise advertised. Please refer to the meeting calendar for scheduled meeting dates. The ARB consists of five citizen members appointed by City Council with an interest in historic preservation. Its primary activity is to review the exterior architectural and/or site modifications or demolitions of properties and stone walls located within the Historic District as well as other outlying designated historic properties that are specified within the Dublin Zoning Code. The ARB considers applications on its monthly meeting agenda and votes on the appropriateness of the proposed changes. Dublin has a wealth of well-preserved historic homes and businesses, which retain the character, scale, and feel of a traditional village center. The Historic District is located along the Scioto River at SR 161 flanked by high bluffs and includes a number of buildings that have received recognition on the federal government’s National Register of Historic Places. The Architectural Review Board (ARB) is responsible for the preservation and maintenance of the Historic District and historic sites as landmarks and tangible reminders of early architecture in Dublin. In spite of the tremendous growth that has taken place, the physical form of Historic Dublin is distinctive and clearly reflects the early history of the community. The Board has assisted residents, businesses, and property owners in maintaining the historic character and visual quality of their properties. The ARB encourages appropriate new development as well as sensitive alterations and additions to existing historic structures. This philosophy strengthens the vision for the Historic District as outlined in Dublin’s Community Plan and as a focal point within the Bridge Street District. The Historic District continues to be a thriving mixed-use neighborhood with residences concentrated along Riverview and Franklin Streets and commercial, institutional, and residential uses intermingled along High and Bridge Streets. The ARB follows the Zoning Code and the Historic Dublin Design Guidelines. The Board takes into consideration the recommendation of these policy documents along with the surrounding context of the District and the specifics of an individual site in determining the appropriateness of a proposal. When Do I Need Approval from the ARB? All plans to construct, modify, alter, demolish or change any site in the Historic District or other outlying designated historic properties that are specified within the Dublin Zoning Code must be approved by the Architectural Review Board. This includes, but is not limited to, all exterior architectural changes, site modifications, signs, fencing, and landscaping on non-residential properties. A Planning staff member can be contacted at 614.410.4600 to confirm if an application falls under the purview of the ARB before submitting an application; a pre-submittal meeting with a Planning staff member is highly recommended. When and Where are the ARB Meetings? ARB meetings are open to the public and are generally held on the fourth Wednesday of each month. All meetings convene at 6:30 p.m. at Dublin’s Municipal Building at 5200 Emerald Parkway, in the Council Chambers. What Should I Expect at the ARB Meeting? The Chairperson calls the meeting to order and tends to any administrative business, including determining the order of the cases on the agenda and approving previous meeting minutes. Each case is discussed individually and may include a presentation by the City. The applicant then has the opportunity to make a presentation to the Board, which may include any additional information that was not previously covered. At this point, the public has the opportunity to make comments about the case. Once all individuals have the opportunity to address the Board, the Board members discuss the case and take action on the case, which may include approval, approval with conditions, disapproval, or postponement. What Happens If I Want to Address the Board? Anyone wishing to address the ARB about a case should sign up on the list outside the chamber doors before the meeting. Names will be called in the order that they are submitted on the sign-in sheet. Anyone wanting to make comments will be asked to come to the podium and state their name and address. It helps if comments are concise and directly related to the case being reviewed. In the instances where multiple property owners would like to comment generally on the same issues, a designated spokesperson is encouraged. How do I Obtain More Information about a Case Before the Meeting? The City of Dublin uses a variety of ways to inform residents about pending cases. Agendas for all meetings are published in both the Dublin Villager and the Dublin News, as well as posted on the City’s website. Specific information related to the case may also be found on the web site: https://dublinohiousa.gov/boards-commissions/architectural-review-board/. Notices regarding the meeting are sent to the surrounding property owners located within a certain proximity to the property. The City also places notice signs on the property to inform the general public. The agenda and related information for pending cases are available outside the chamber doors before the meeting and during the week of the meeting through the Planning Department. For additional information, or to speak to the planner assigned to the case, call Planning at 614.410.4600. 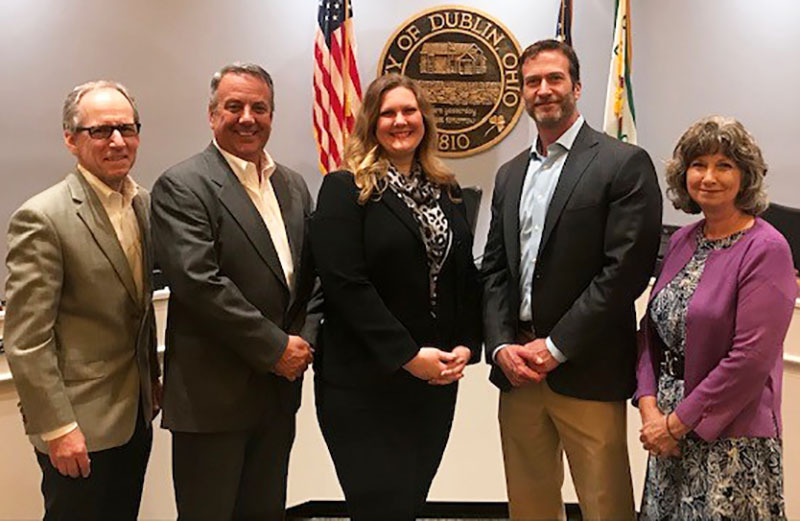 The City of Dublin is designated as a Certified Local Government by the Ohio Historic Preservation Office. Dublin has an approved program for recognizing and protecting its historic, architectural, and archaeological resources. Dublin’s Architectural Review Board (ARB) has been designated with the authority to oversee architectural changes to historic resources, buildings, and sites. Activities also include historic surveys, property nominations for the National Register of Historic Places, historic tax incentives, and matching grants.